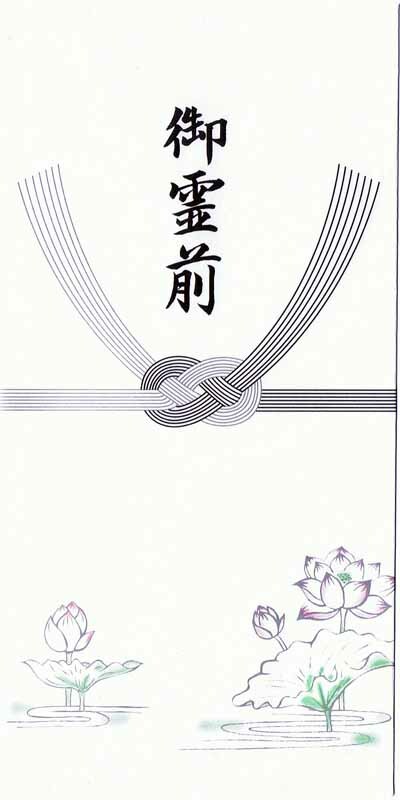 One of the envelopes designed for giving money in Japan is the funeral envelope. The Kanji on this envelope (御霊前) mean, "goreizen", an offering at the altar for someone who has departed the world of the living. This should never be confused with any other black and white or black and silver money envelope in Japan. There are a few similar in color, not meant for funerals but, the Kanj is noticebaly different. A foreigner, like me, who isn't very proficient at reading or writing kajni, should always get assistance when planning to use a Japanese money giving envelope. You don't want to make the mistake of confusing this envelope with something you thought was a "Get Well Soon Card". An excellent reference posted by Alice Gordenker on JAPANESE MONEY ENVELOPES shows more examples of the these works of art used for handing over cash on different occasions in Japan. She is also a longtime and very popular columnist with THE JAPAN TIMES. WIKIPEDIA has a photo displaying a Condolence or Funeral Money Envelope and a lengthy article describing the customs and culture surrounding funerals in Japan. More search engine research will lead to all sorts of information and it doesn't take long to realize, the customs may vary depending on which Prefecture you are looking at, in Japan. In Okinawa (Ryukyu Islands) we fly the Japanese flag but, we do things differently, sometimes. And from village to village or one island to another, our customs and traditions may vary. So, my recommendation to anyone interested in using Japanese Money Envelopes would be follow an insider's tips. Talk to a local and you can't go wrong. Whoa careful....I can imagine poor old grandma's face when she opens her birthday card and someone's put one of these in by mistake. Yep, that'd be a pretty serious offense, even worse than that time I saw one of these presented at a wedding! WU HU HU ! Half a Million Views Coming Soon ! World Oceans Day 2011 Why Should We Care? Photo Essay Quiz: Which Turtle is the Dude ?